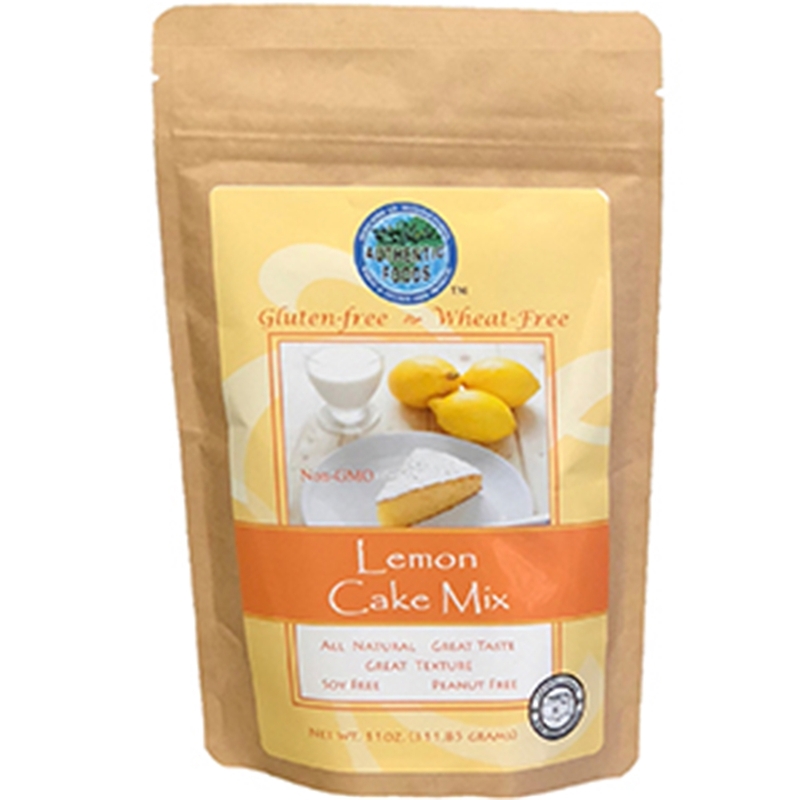 The Authentic Foods Lemon Cake mix is all natural and is great for any dessert occassion. It is moist with absolutely no trace of grittiiness. Just add eggs, milk (or a non-dairy substitute), and oil, bake and enjoy. You can also add a lemon buttercream frosting an a lemon custard filling for an extra touch of sweetness. Ingredients: Granulated Cane Juice, Rice Flour, Potato, Lemon Juice, Tapioca Flour, Psyllium, Cellulose, Calcium Acid Pyrophosphate , Tricalcium phosphate, Natural Non-Dairy Flavors (Gluten Free), Sodium Bicarbonate, Salt, Citric Acid..
"Now that the cold weather has finally hit, I took the opportunity to do some re-shuffling in the kitchen cabinets. I had forgotten that we had a gluten free, wheat free Lemon Cake Mix from Authentic Foods that remained un-tried. Since it had been a while that I made Rob a celiac-safe dessert, I whipped up the mix and could not believe the results! To make 1 gluten free lemon cake, I first preheated the oven to 350 degrees, lightly sprayed a 9 in. pan with Pam, then I mixed 2 eggs, ¼ cup milk, 3 tablespoons of water and 3 tablespoons of canola oil in a mixer. The package cautions not to over beat (affects the rise-factor) - which I tried hard not to do. I poured the batter in the pan, let it sit for 5 minutes, then baked for about 30 minutes. The package suggests 30 min. for an 8 in pan, 35 min. for a 9 in. pan, and 25 minutes for 12 cupcakes. As my oven runs hot (which I forgot), I should have pulled the cake at 27 minutes- but no matter. I then let the cake cool and sprinkled with powdered sugar. The gluten free Authentic Foods Lemon Cake looked very attractive with its sugar sprinkling over the honey brown exterior. Granted, it didn’t rise like a bundt cake- but that’s okay. I gave Rob the first wedge and awaited the true test. The celiac-friendly dessert was bursting with lemon taste, was light with a delicious sponge interior, and was a definite hit. I was completely blown away by a gluten free lemon cake! I couldn’t believe it lacked flour. Rob loved it so much, the cake was history by the next morning. " "Today was my birthday and I made the lemon cake I bought from "GIG". It was very good! I made it to according to directions with a few alternatives..2%milk,......After it was baked in a 8 inch square pan, I poked holes in it with a tooth pick and poured lemon juice and powdered sugar over it and let sit for a spell! It was very good!!!!! !Only one small problem........I couldnt just eat one piece....I ate several! Very tastey...Thank you so much!! Keep up the good work! Thank you for coming up with these recipes in boxes and for the web!!!!!!! Thank you"
Preheat oven to 350 degrees Fahrenheit. Lightly grease the bottom and sides of a 8” cake pan. Beat eggs, milk and oil until foamy and slightly thickened (about 1 minute). Add the cake mix and slowly blend until smooth (mix will be some-what thick). Do not over beat. Pour batter into prepared pan; let it set for 5 minutes, and then bake immediately. Bake for 25-30 minutes. The cake is ready when a toothpick or utensil poked into center of the cake comes out clean. Cool in pan for about 15 minutes before serving.